Dishwashing Gel with Apple Cider Vinegar is produced by the Russian brand Zero. The product has several important advantages as compared to mass market dishwashing liquids. It is natural and free of harmful ingredients such as SLS (sodium lauryl sulfate), parabens, phosphates, formaldehyde and petrochemicals. It effectively removes grease even in cold water. Completely biodegradable. Not tested on animals. 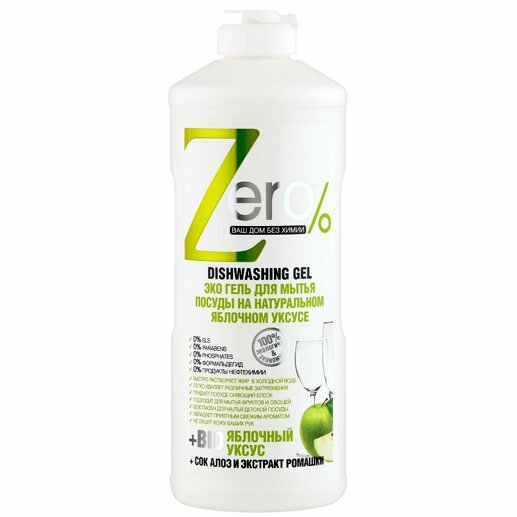 This Zero dishwashing gel can be used on dishes and utensils made of different materials (glass, plastic, metal, ceramics, wood). The product is environment/kid friendly, it can be used to wash hard-skinned fruit and vegetables. The gel excellently copes with dirt and grease, making your dishes squeaky clean and shiny. It is easily rinsed off and does not remain on dishes. This natural dishwashing liquid does not irritate skin or mucous membranes and has a light, pleasant scent. The product is enriched with apple cider vinegar that is an effective natural cleaning agent. The gel also contains chamomile extract, green tea extract and aloe vera leaf juice. These ingredients have a moisturising, soothing and nourishing effect on the skin of your hands. They prevent skin dehydration and even accelerate the healing of minor skin injuries. Lemon oil gives the gel a natural, fresh scent. Biodegradable formula. Suitable for domestic wastewater treatment systems and septic tanks. Directions. Apply a small amount of balm onto a sponge. Lather, wash the dishes, rise with clean water. Ingredients. Aqua/Purified Water, 5-15% Anionic Surfactants, < 5% Non-Ionic Surfactants, Salt, Apple Cider Vinegar, Aloe Vera Leaf Juice, Organic Lemon Essential Oil, Organic Chamomile Extract, Organic Green Tea Extract, Perfume, Kathon Preservative, Citric Acid, CI15985, CI 19140, CI 42090. Want to buy Dishwashing Gel with Apple Cider Vinegar? Call us or submit your order via our web site! Zero is a series of household cleaning products formulated with natural ingredients. The products are manufactured by the Russian company “Pervoe Reshenie” (First Solution). The company is known for its numerous organic and natural cosmetic brands such as Planeta Organica, Baikal Herbals, Organic Shop, Organic Therapy, and others. Its specialists create effective and affordable skin and hair care products, baby care products and cleaning supplies that are safe for human health and the environment. The company launched its first brand, Granny Agafia's Recipes, in 2002. Since then, it has been continually developing and expanding. Pervoe Reshenie is constantly improving its formulas, searching for new recipes and ingredients, updating production equipment, processing technologies and product design in order to provide consumers with high-quality, natural and safe products. Today its cosmetics and household products are popular both in Russia and its neighbouring countries. Zero is one of the company's youngest brands. It offers effective and safe house cleaning products that are free of aggressive and dangerous chemicals. All products are formulated with natural surfactants, detergents and cleaning agents which were used decades and even centuries ago. The effectiveness of these ingredients is time-tested. By using them, Zero gets back to basics. Zero cleaners and dishwashing soaps contain baking soda, lemon juice, mustard, vinegar, chalk, sea salt, natural soap, blue clay, herbal extracts and other natural ingredients.